Michael Morrison of Light Efficient Design UK irons out some of those knotty problems. Despite the efforts of those ‘dodgy dealers’ out there somehow continuing to conjure up stocks of GLS, Mercury, MR16 and HID lamps, upgrading to a LED light source is now almost mandatory. Legislation is pushing all the old favourites into oblivion. Of course, Brexit might change all this should it suddenly be decreed antique rush lamps et al are to be part of our new trade agreements with the outside world. But don’t hold your breath! This autumn will most likely see the final death rattle of the MR16. The mercury lamp has gone throughout most of Europe, and other old friends will follow in the coming months and years. So, assuming ripping out existing fittings and completely redecorating isn’t always an option for making way for LED, the retrofit approach is clearly the only way to go – especially where expenditure, maintenance and minimal architectural disruption are all priorities. It’s a relatively simple procedure, taking a few minutes to complete and enabling the existing fittings and fixtures to be retained. Do I really need to remove the existing control gear? Yes, unless you want it to come back and bite you! You don’t buy a shiny new car and ask the garage if they can possibly pop in the engine from your old Cortina. So, why oh why, do some clients insist that 20 year old control gear be left in use with new lamps? A typical wirewound ballast (because that’s what is in those old fittings) will add about 10% to the circuit watts. 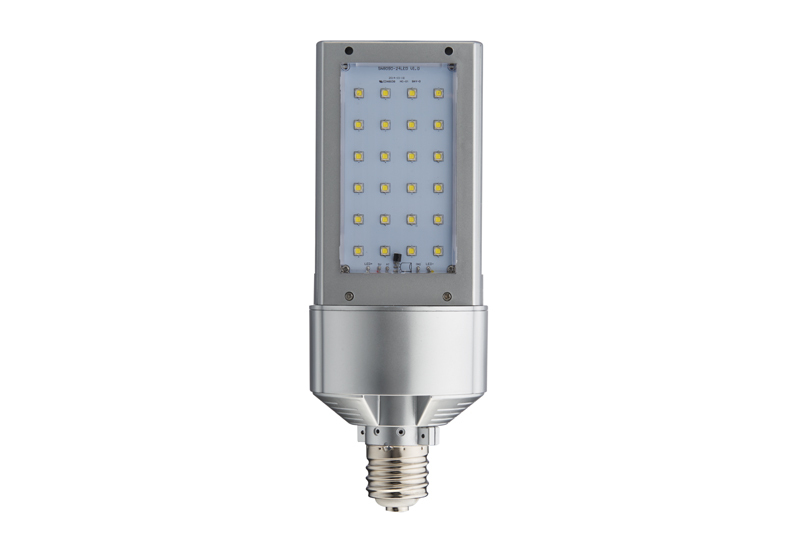 Your 100W led lamp is now running at 110W. SOX autotransformer ballasts can be upwards of 25%, so a 35W LED lamp could be using almost 44W. Then there is probably the most important question; how much longer will that old control gear continue to work? A five-year warranty on the new lamp will not cover the failure of the original ballast, so get ready for those cherry picker hire invoices. This is a common complaint and comes down to choosing the right shape of LED lamp. Never put a corn lamp in a high bay or into a floodlight. In both cases the lamp gets in the way of its own light output. Technically the light output ratio of the wrong lamp will lose you a high percentage of your newly acquired efficient lumens. Back to square one possibly. 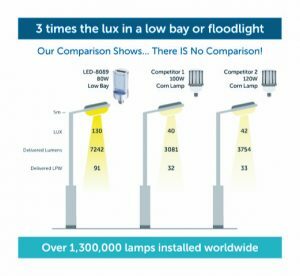 Our own tests have found more than 66% light loss can be experienced from the existing fitting housings when fitted with standard corn lamps. 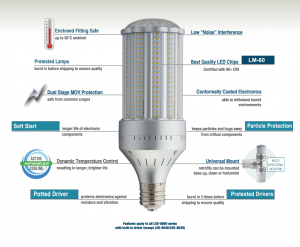 This risks throwing LED lumens and therefore money away. First and foremost, you need to make sure that real and accredited data is supplied. It’s easy to make up lamp performance figures and you would be surprised how much of this fiction is out there. LM79 and LM80 standards ensure that the lumens and life are really there. Look for manufacturers that offer a comprehensive warranty; Light Efficient Design offers fives years, including on-site for larger installations. This crops up time and again, especially with enclosed fittings. Many retrofits just aren’t designed to work with enclosed fittings, quickly leading to overheating and failure, not to mention making them a potential fire risk. 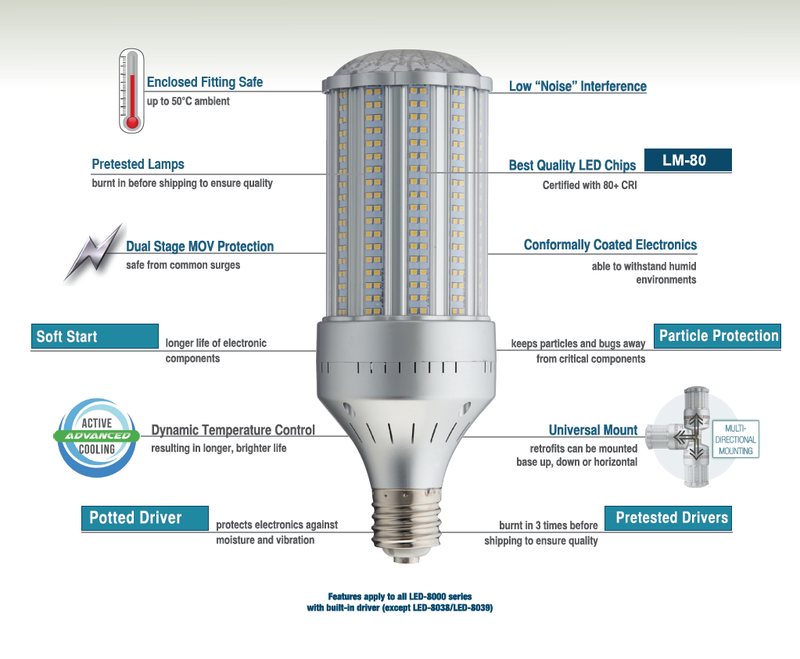 Look for LED retrofits that have circuitry and fans which regulate and adjust the junction temperature of the LEDs. 85C seems to be the magic figure; get an LED junction hotter than that and the life falls dramatically. 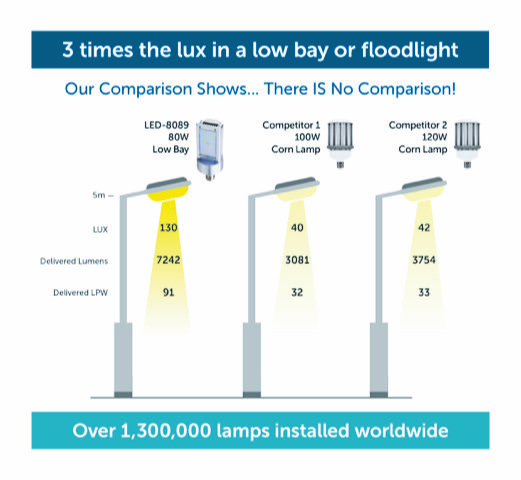 Light Efficient Design has carried out extensive testing to understand exactly what happens to the LED junction when our lamps are installed in high ambient conditions in enclosed fittings. With just 10degC above 85C the LED life is halved, but our thermal feedback and fan cooling keep both the LED and electronics at or below the magic 85c figure.